Edible Eggless Cookie Dough for your sweet tooth today! You know every time you sneak bites of your traditional cookie dough and cringe just a little because of the raw eggs? Well, try my eggless cookie dough that is perfect for snacking on by the spoonful! Wanted to share this recipe with you before next Monday’s post….you’ll need it! Place softened butter into a medium mixing bowl. Cream sugars until well combined. Add vanilla stirring well. Stir in flour, salt and chocolate chips until dough forms. Cover tightly with plastic wrap or lid until ready to use. Best if NOT refrigerated. I’m with Maria, pass me the bowl!!! That is great!!! I can’t wait to see what is coming on Monday. My family would definitely all be fighting for this bowl. Yum! All the better to be eating by the chunk! I LOVE this! I could eat the whole bowl! this recipe is so dangerous – I’m sure I could eat half the bowl! love this! This looks so yummy except, my batch is all crumbles…? My dad and I baked them at 375 f just to see if they would turn out nice. We didn’t time them, we just watched to see when they were golden brown.These cookies,when baked, are almost as good as they are unbaked! ooooohhhh…soooo good!This recipe is absolutely AMAZING! I don’t know why I never thought of it myself. Develop and draft your considerations. Redesign Adjust for right highlight and declaration structure. Research your conveyed substance a couple times. You won’t find all slips immediately. Solitary readings can help find unique sorts of omissions. Close excitement to adjusting and reevaluating, will make your making clearer to people. My mouth is watering just looking at your pictures! 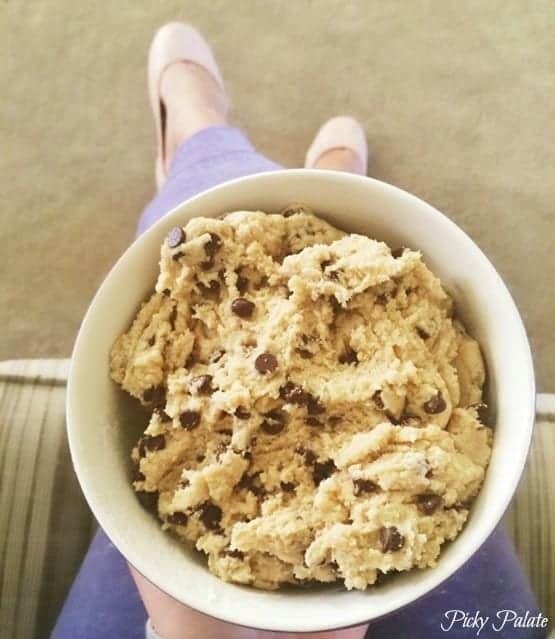 There is always time for cookie dough!! Thank you for this recipe!! Cookie dough is soo good, and now it’s safe,too! 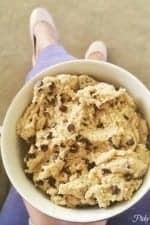 I have a major sweet tooth and have been trying to find a “better for you” cookie dough recipe and this is SO GOOD even without the chips, not a big fan of chocolate. This didn’t work well for me. I made a batch and it was super grainy and crumbly. I figured it had some something wrong so I made another batch carefully following the directions. Sadly, it turned out the same. I badly wanted my dough to taste as amazing as the picture looks but it didn’t happen 🙁 It’s like eating Moon Sand and isn’t very sweet. I love PP but wanted to share that this didn’t work. I’m pretty sure that you forgot the milk when you were typing this recipe. I made this recipe just as is and it turned out wonderfully! We made it for friends and family for Christmas gifts and everyone raved about it, most eating gobs of it upon opening. Thanks! would it still taste good if I put it in the freezer overnight Then let it thaw the next day? This recipe looks delicious! I love cookie dough, so I am going to love trying this out and not worrying about getting sick! I have made this before and have refrigerated it, since I feel as it holds the shape longer and won’t melt too much. Here is another recipe, just as delicious, with refrigeration: https://omghow.com/articles/eggless-cookie-dough . Thanks so much for your insight! I just made this, but only made 1/4th the recipe. I ate it all in one sitting! So good! I love your website! 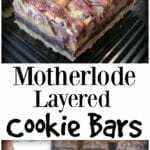 Best cookie recipes ever! How much fun and exciting… You deserve good things to come your way! Someone has already mentioned that it’s missing the 1/4 cup milk but I just made it as per recipe and it turned out like dust, just want whoever makes this next to know to add the milk and it fixes it!